So I made a pre-selection based on the top models of premium brands and put them in an overview with the features I find the most important. The Canon Pixma MG series will be available in the Netherlands from September onwards so I decided to include the range. RRT ? € 219,00 € 159,00 € 99,00 ? ? Off (W) 0,6 0,5 0,4 0,4 0,36 ? Standby (W) 1,3 2 1,6 1,4 8,1 ? Based on the above overview I decided to wait 1 month for the Canon Pixma MG5250. It has all the connectivity I need, has great print quality, comes in a reasonable size and appears to come with a decent price. Currently only the Recommended Retail Price is available. What are you experiences with all the above mentioned all-in-one printers? 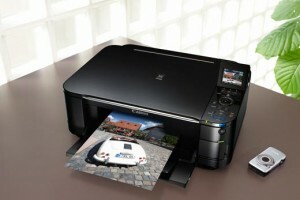 Heb je inmiddels al hands-on ervaring met deze printer? Ben heel benieuwd of hij kan scannen en de resultaten in pdf wireless in een mapje op je desk/laptop kan plaatsen. Ero deciso ad acquistare la MP640, ma ho visto le nuove MG e ciò mi ha creato confusione. Probabilmente la diretta concorrente della MP640 sarà la MG6150, ma il prezzo è veramente molto alto anche se devo stampare fotografie e se la MG6150 ha l’inchiostro grigio che per le foto, soprattutto in bianco in nero, è molto importante. Sono veramente molto incerto, ma penso che prenderò la MG5250 che è un nuovo modello ed ha buone caratteristiche ad un prezzo possibile.